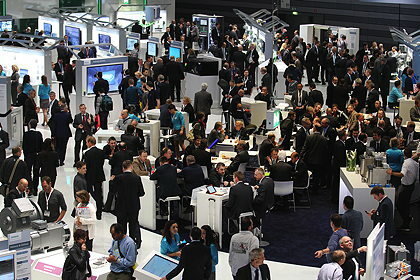 The annual SPS IPC Drives show in Germany has been going for 25years, and has grown almost every year. The 2014 event, held in November, set a new floorspace record, but the number of visitors slipped for the first time. Germany’s massive SPS IPC Drives automation and motion engineering show has just celebrated its 25th anniversary and, in doing so, set some new benchmarks. For the first time, it occupied 14 halls at its Nuremberg venue, and it set a new record for the total area covered – 117,800m², compared to 114,000m² in 2013. At the first event in 1990, the show attracted 63 exhibitors and 3,420 visitors. The growth since then has been almost relentless and the recent show attracted more than 1,600 exhibitors and almost 57,000 visitors. But it’s not all good news for the organisers. For the first time in 25 years, the total number of visitors dropped, from 60,027 in 2013 to 56,787. And despite occupying a larger floor area than in 2013, the total number of exhibitors dipped slightly from 1,622 to 1,602. However, the number of non-German exhibitors grew from 485 to 508, with the biggest foreign exhibitor, Italy, sending 107 companies to Nuremberg, compared to 84 in 2013. In fact, all of the top ten foreign countries sent more exhibitors than in 2013, with one exception ­– the UK, in seventh position, whose representation fell from 21 to 18 companies. Siemens had an entire hall to itself for the first time. Its massive display (above), covering more than 3,000m2, was built using 2,700 tonnes of materials that were brought in by 100 articulated trucks. The stand included 29km of cabling and 115 display panels of varying sizes. During the three-day show, visitors to the stand got through 12,000 pretzels, 6,600 sausages, 220kg of potato salad, 120kg of gingerbread and 15,000 cups of coffee. Thge SPS show is expanding into other countries. Since 2010, there has been a version in Guangzhou in China, followed in 2011 by Italy. This year, the SPS organisers are launching events in India (in February) and Shanghai (in June). A highlight on the ABB stand was a new IP55-protected, wall-mounting version of its general-purpose ACS580 drive (below), spanning ratings from 0.75–250kW and voltages from 208–480V. The only dimension that increases over the IP21 versions is the depth. A control panel, also protected to IP55, can be housed in the door. Baumüller has extended its b maXX 3300 series of small servo controllers to cover five different power ratings from 0.75–5kW. 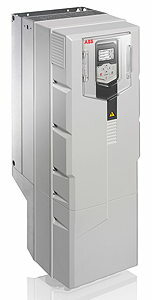 It is also offering rectifier and feedback options for its modular b maXX 5000 drives for motor outputs from 1–90kW. A 175mm-wide water-cooled version of the 90kW drive is claimed to be one of the smallest in its class.